Photostat machine on rent in Karachi Ricoh 2500 is available at Paragon Copier Solution. 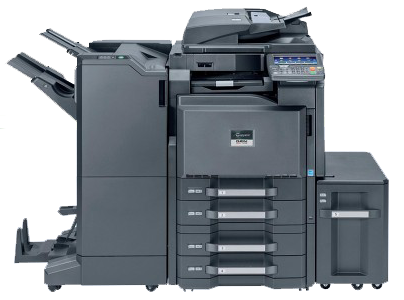 Ricoh Aficio MP 2500 is a standard copier which prints 25 copies per minute. Additional functions are available such as a printer, fax, and scanner modes. Moreover, It won the “Pick of the Year” award from Buyers Laboratory Inc in the fall of 2007. When tested, they were found to be extremely easy to use. Ideal for small to mid-sized work groups, the Ricoh Aficio MP 2500 has a monthly duty cycle of 25,000 pages. Print speeds are quick with a multi-copy time of 25 pages-per-minute; first copies are output in 6 seconds. The Ricoh Aficio MP 2500 has standard paper sources start with dual 500-sheet drawers and 100-sheet bypass tray. When all paper drawer options are utilized you can reach the max capacity of 2,100 pages. Automatic duplexing is a standard feature; it allows you to convert the single-sided input into the double-sided output for efficient paper management and professional-looking documents. The black toner cartridge (841000) for the Ricoh Aficio MP 2500 is available in either the genuine Ricoh brand or premium Precision compatible. Both choices have an estimated page yield of 10,500 at 5 percent coverage. Paragon is the most Successful business leader in the field of photocopier machine trader. The Ricoh Aficio MP 2500 Digital Imaging System comes in. It provides the capabilities small departments, work groups and independent businesses need—including copying, printing, scanning, faxing and finishing. More importantly, it packs all these user-friendly capabilities into one fast, affordable, compact device. • Pick up your pace with 25 ppm copy and print speeds. • Minimize handling time using the 50-Sheet Automatic Reversing Document Feeder. • Eliminate manual collation and stapling with the optional finisher. • Save paper and shelf space when you print or copy two-sided documents with the duplexing capability. • Keep jobs running with minimum intervention using the generous 2,100-sheet paper supply. • Streamline document management when you scan, distribute and archive up to 1 1″ x 17″ originals. Paragon offers flexible and affordable copier on monthly rent basis for many different applications. Whether you need it for four days or four years, we can work with your needs. You pay month-to-month for as long as you need it. This gives you totally flexibility over photocopier machines. If you would like to upgrade copier, renting you copier gives you the complete ease and relaxation to help your business grow and flourish without worry.